It is extremely important to work within a calibrated lighting environment when creating textures and materials for StemCell models. Since StemCells are physically based, you’ll rely exclusively on HDR images for lighting your scene. To assist you, we’ve created a special HDRI with calibrated values and zero color information. By using the supplied HDRI, you will not have to worry about incorrect values causing the image to be too bright or too dark, and you will not have to worry about colored lights or objects bouncing unwanted color information onto your model. You will notice the terms Specular workflow and Metallic workflow mentioned quite a bit when talking about StemCell models. StemCell requires both Specular and Metallic texture maps be created since most offline 3D renderers (i.e. V-Ray, Mental Ray, Arnold, etc.) require Specular textures, and most real-time engines (i.e. Unity, Unreal, Lumberyard, etc.) require PBR Metallic textures. Providing textures for both workflows gives maximum portability between the two types of outputs. Specular/Gloss workflow uses Diffuse, Specular, and Gloss maps. PBR Metallic workflows us BaseColor, Metallic, and Roughness. No procedural materials. Any procedural materials must be baked into texture maps. Basic renderer materials with texture maps only. Production applications must be in Specular workflow. Diffuse, Specular, Glossiness, and Normal texture maps applied to every material. Real-Time viewer applications must be in Metallic workflow. BaseColor, Metallic, Roughness, Normal, and AO texture maps applied to every material. For most materials, you can keep your reflective IOR values, for each type of material, within a very small range. Reflection(Specular map) values are usually never higher than RGB 240, and never lower than RGB 40. The value should also never be darker than your diffuse value. Glossiness values should almost never drop below 0.5 value or RGB 128. If an object still seems too glossy at 0.5 or RGB 128, you need to lower the reflection value or have an incorrect IOR value. Metal materials should always have a very dark diffuse value usually between RGB 5 – 40. If you are creating a colored metal material that requires color (i.e. gold or copper), then the RGB color should be in the reflectivity (_Specular) texture map. IOR is simulated by the material BRDF and relies on the metallic map to assign its overall reflectivity value. Dark grayscale values (dielectrics) get lower simulated IOR values while bright grayscale get higher simulated IOR values. Roughness maps are essentially the inverse of glossiness maps in how they are read. Black is smooth or shiny, while white is rough or flat. Roughness values should almost never exceed 0.5 value or RGB 128. If an object still seems too glossy at 0.5 or RGB 128, check the Metallic and BaseColor maps. BaseColor has effects reflectivity depending on your Metallic value. It represents the Diffuse and Specular maps combined for the Metallic workflow. For a more in depth understanding of Specular and Metallic workflows and values see PBR Values and Comparison or visit some the External Resources. Texture maps must be named with the same name as the material they are applied to followed by the correct suffix. There must be no text after the suffix. Some additional maps may be required when additional effects are present (Self Illumination, Opacity etc.). Since the goal of StemCell is to maximize portability of a model between applications and game engines there are some limitations as to what materials can be handled. Real-time engines can only process transparency of a material which means refractive materials like glass or liquids will be problematic. With these limitations glass materials must use Opacity maps in place of Refraction. This will allow for editing the transparency of the material to an opacity value that provides similar render results across all programs. Refractive materials need to be separated from the regular dielectric materials to be processed correctly. Opacity map used in place of refraction for Max V-Ray. Opacity map on material in UE4 with Add mode transparency. Notice how the solid parts of the glass are made transparent in real-time. All texture maps are named the same as the material they are intended for and have the correct suffix. Each texture map must be in the correct color space as defined in the table below. All texture file names must be correctly suffix as listed below. Specular/Gloss texture maps need to be plugged into a basic material for the renderer in use. Maps need to be applied to correct slots and have full 100% value contribution. Values less than 100 will blend the maps with the color or value specified for that slot giving inaccurate results. Partial map contribution does not carry over when imported into other applications. In certain situations a Blend material may be required if a material has dielectric and metal values that can not be separated by the geometry. See When to use Blend Materials for more information on when this applies. 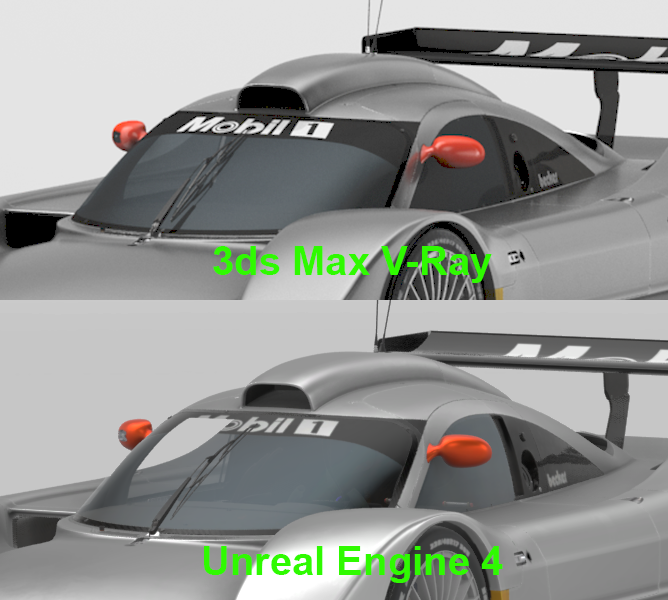 See Max V-Ray Material Setup. See Maya V-Ray Material Setup. Marmoset is a great real time environment view that is recommended for verifying your Metallic workflow maps. Verifying that Metallic textures look correct within the same calibrated HDRI environment as production application guarantees that the StemCell will look correct in all desired outputs. StemCell requires specific option settings in Marmoset. Settings must be done to all materials for Marmoset to display accurate results using texture maps created in a Linear Workflow.